CLIFTON VILLAGE is a lively young community, which offers many traditional English pubs, varied restaurants, fashionable shops, art galleries, Bristol Zoo, Clifton College, The Suspension Bridge, The Observatory with it's Camera Obscura, and fine Georgian listed terraces and squares all within a few minute walk of No 9 Prince's Buildings. M5 from south: Junction 19, Take A369 to Clifton via toll bridge then take the first right hand after the bridge into Sion Hill continue down Sion Hill and past the Avon Gorge hotel which is located on the right, and Number 9 is the next terrace house to the Avon Gorge hotel. Number 9. Princes Buildings has double red front doors. M5 from north: Junction 18, Take the A4 to Bristol, and just before the Clifton Suspension bridge turn left at the set of lights into Bridge valley road, and at the top of the hill turn right into the Promenade, and then take the first right turn toward the suspension bridge. 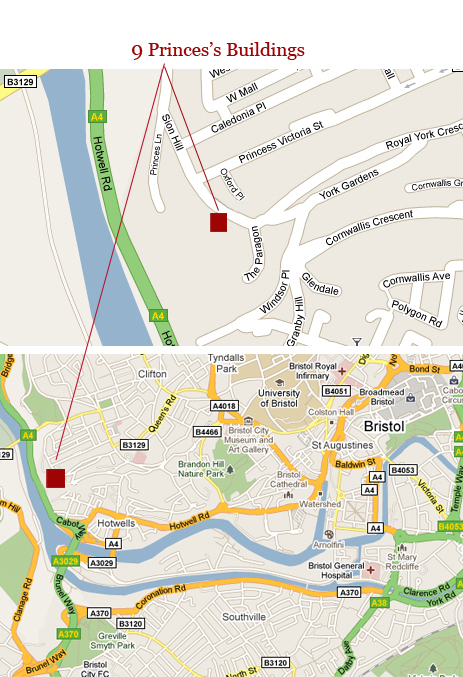 At the cross roads, go straight across into Sion Hill, continue down Sion Hill and past the Avon Gorge hotel which is located on the right, and Number 9 is the next terrace house to the Avon Gorge hotel. Number 9. Princes Buildings has double red front doors. M4 from London: Junction 19, take M32 to city, follow signs to Clifton and Clifton Suspension Bridge just prior to the Suspension Bridge turn left down Sion Hill continue down Sion Hill and past the Avon Gorge hotel which is located on the right, and Number 9 is the next terrace house to the Avon Gorge hotel. Number 9. Princes Buildings has double red front doors.